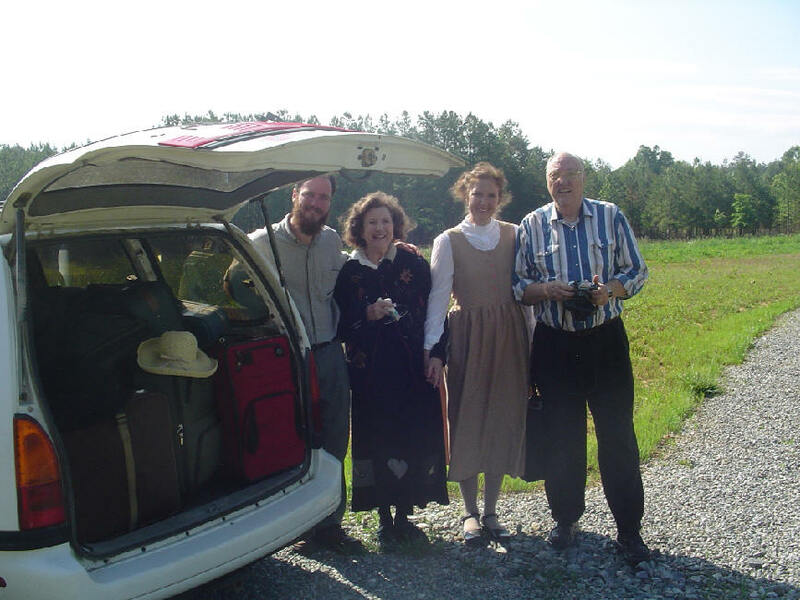 Although this was our shortest trip to date (only 2 ½ weeks), it was still packed full with ministry and the blessing of our Lord. With each trip, we go with ministry goals and objectives; having these clearly in our minds helps us to be focused in our activities so that the best gain is obtained with limited time and energy. However, these goals are held loosely, because this is His work, not ours; and He has the prerogative to change things at any time and for any reason. 2. 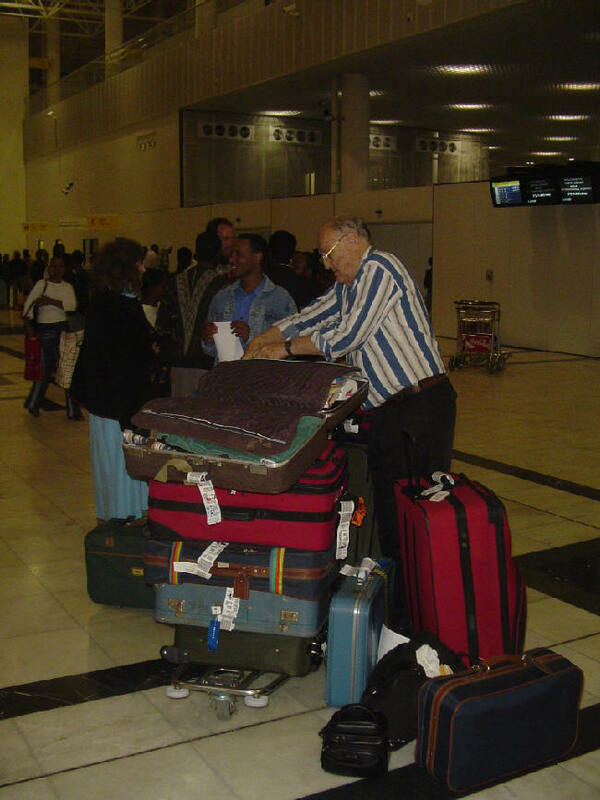 To carry funds to the Ethiopian church for the purchase of Bibles and for the building of churches in Alaba. 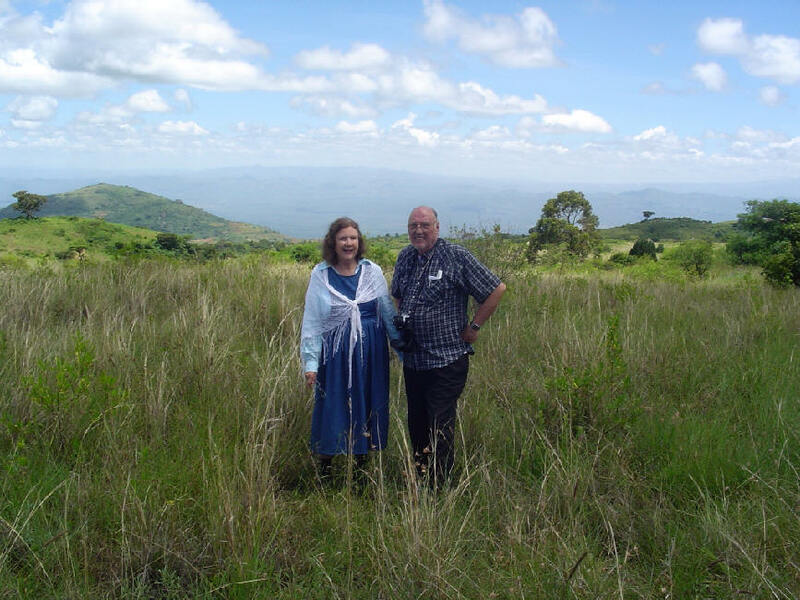 The 9 rural churches in Alaba need to be built without delay; they are suffering severe persecution now, and the erection of buildings may alleviate some of the persecution. Each church requires $2,250 for materials. 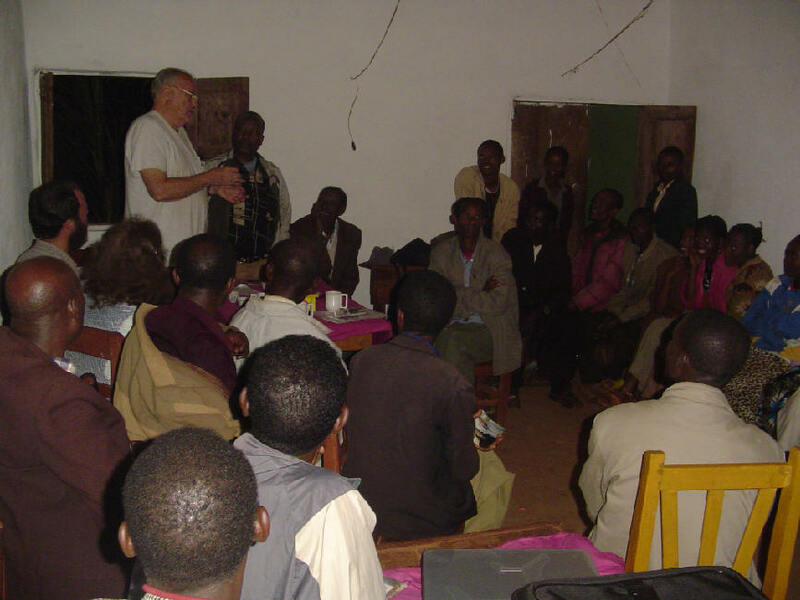 The Bible memory program ends in Burji and the main church in Alaba Town on September 10, 2006. We don’t know exactly how many people will complete this program, but we must be prepared to supply the Bibles we’ve promised by the end of September. (Some estimates are that as many as 3000 are memorizing, necessitating $12,000.) If we hand-carry these funds, then the money goes much further. 3. To follow up on the ministry that we did in Dec05/Jan06...computer training, checking the usage of the flannelgraph, taking more eyeglasses, etc....just as the Apostle Paul went back to check on the churches he had planted. In these reports, I will not only share with you how our Lord met these goals, but also how He brought many, many exciting, unexpected blessings and ministry opportunities. In this first report, I want to focus on Mom and Dad in this trip. First, a bit of history. In the 1950s and 1960s, as a young couple establishing their family, Mom and Dad forsook the calling of a materialistic, “get ahead” American culture. At this time in our country’s history, we were still feeling the flush of victory from WW II and were catapulted into the role of the world’s leader. Our country had discovered productivity, women were now in the work force, personal incomes were sky-rocketing, and the accumulation of material goods was the end-all and be-all of life. 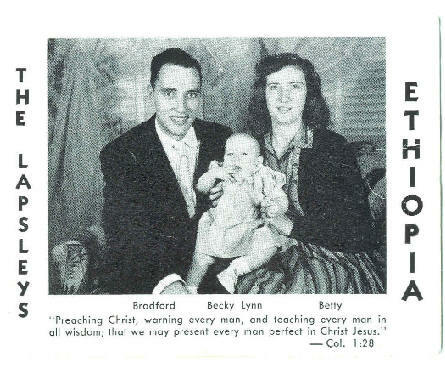 The missionary prayer card for our family in 1954. Against this secular backdrop, our Lord was calling His own army to forsake the “easy” life and go to the world with the Gospel. Many mission organizations were established, and churches sent young missionaries to the far reaches of the world. Along with many others (like martyr Jim Elliott, who was a college classmate of Daddy’s), my parents joined this missionary army and set sail for Ethiopia. They were young, only 22 and 26 years old. They were busy having their babies. They were “innocent” to the ways of the world, wanting only to serve our Lord. Over the next 10 years, the prime of their life was spent living in very primitive circumstances, amongst tribal peoples who were often barbaric and hostile, alone and isolated from their own family and culture, even separated from their own children as they were sent off to boarding school. During those 10 years, they had repeated bouts of hepatitis, Mom delivered 6 babies (almost losing her life), they suffered the usual intestinal challenges, and they finally came back to the States on an emergency basis, thinking Mom was dying from a brain tumor. As challenging as the years in Ethiopia had been to this young couple, the first years back in the States were much more so. 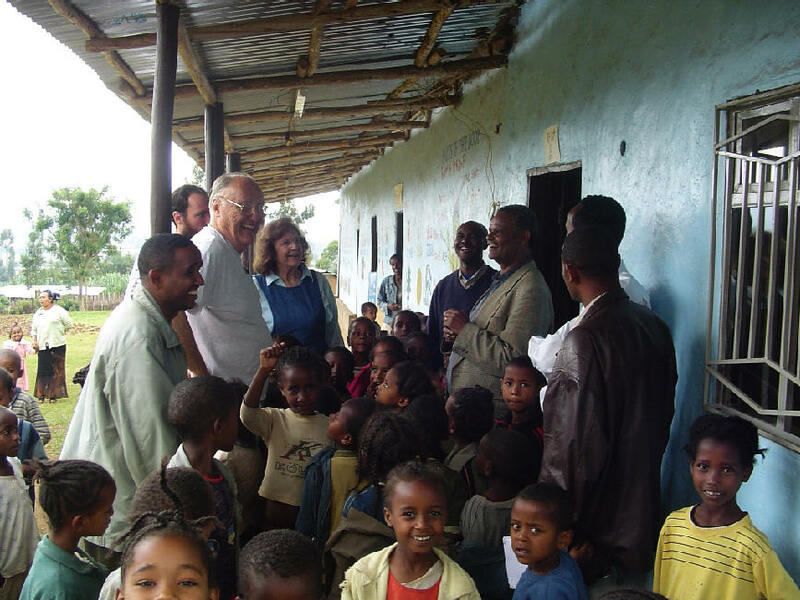 Their heart was still in Ethiopia; they loved the people greatly; they had unfinished work to do. And yet our Lord, in His wisdom, was preventing them from returning. It took 13 years before He allowed them to discover the reason for Mom’s massive headaches; her top vertebrae had been jammed into her skull from traveling on the rough roads of Ethiopia. By the time she was healed, their children were in high school and college. 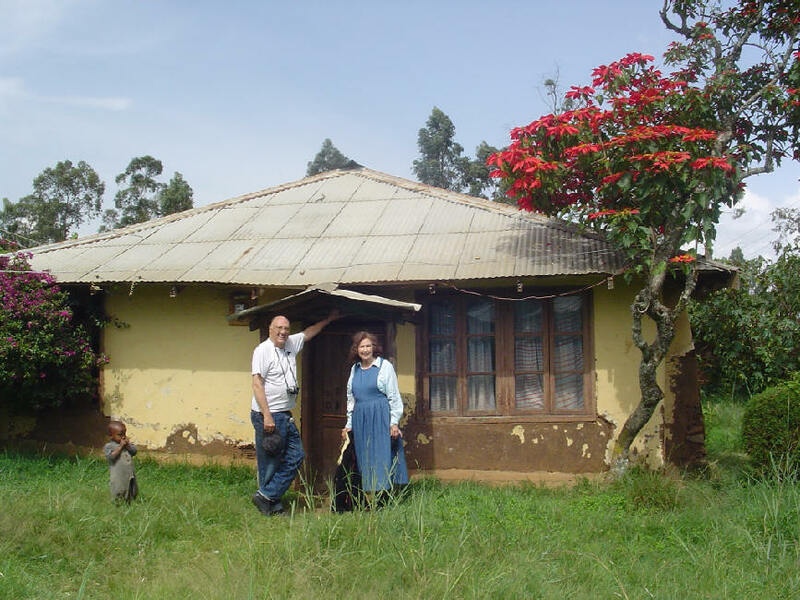 Their first home in Ethiopia: Hosanna Station. The current leaders of the Hosanna church, 4000 strong! As a boy, Lampiso (left) helped mom in the garden. Simeon (right), a former student, is now the Director of the only Christian school in Hosanna town. These “shimagelis” (old people) came to visit Daddy. He gave a word of encouragement to the Burji leaders. I know there are many of you reading this report that are at their stage in life, or are perhaps at the stage when they first went abroad. You may be asking the same question. I have a message for you, a reminder from our Lord Jesus. Work for His Kingdom, in His Name is NEVER in vain! You may not see the results, but the benefit is still there! To forsake the temporal world for the eternal one, to yield your heart to love His ideals instead of the things in our culture, to expend your time, energy, money, skills in obedience to His appointment instead of personal gain and recognition….. Oh, my dear friend, the Scriptures are true! There is no REAL gain, no eternal gain, without surrender of everything to our Saviour! Only in complete surrender is there victory…that is the irony of the Christian life. VICTORY IS GAINED ONLY THROUGH COMPLETE SURRENDER! The Evil One is always casting doubts, just as He did to Eve in the Garden. “Has God said that his Word will not return void?” This doubting is especially targeted to the older servants of our Lord. 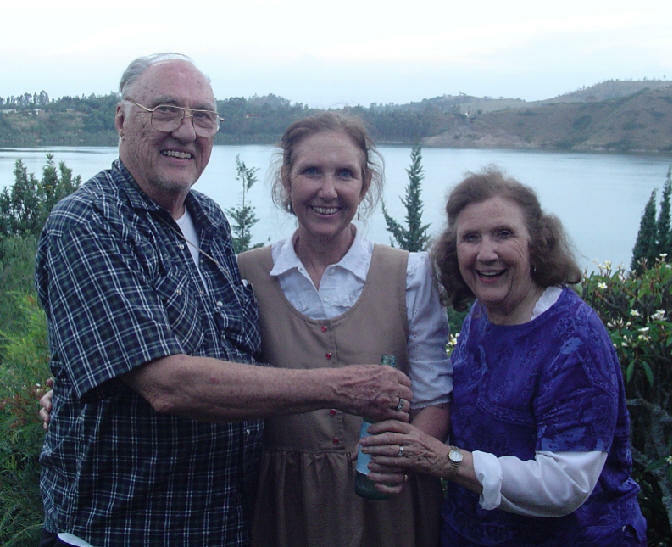 So in taking Mom and Dad to Ethiopia, they were able to see with their own eyes a small measure of the fruit of their labor. They were absolutely blown away by the growth of the Lord’s church in Hosanna and Burji, our two mission stations! Strong leaders were clearly in evidence. 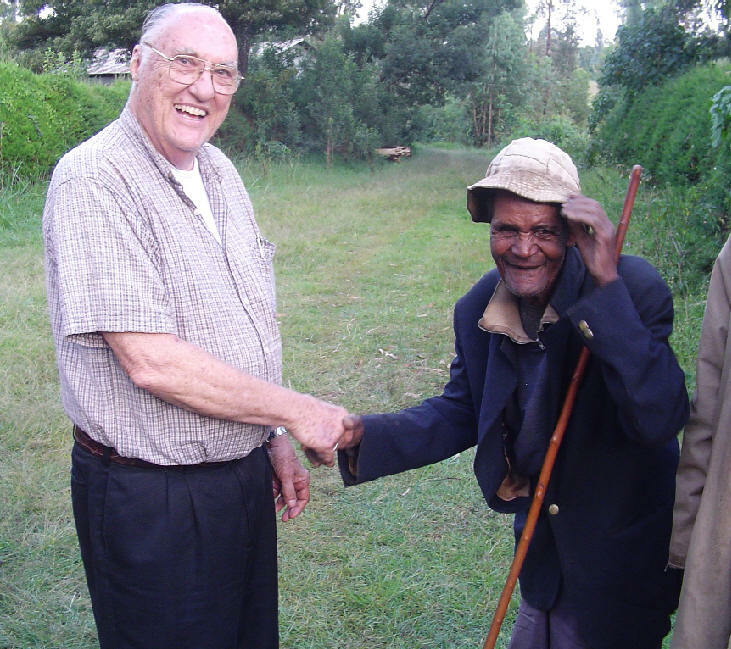 They were active in evangelism, not only locally, but also sending missionaries across Ethiopia. And they were diligent about Christian education, not only for children but also for lay leaders. Everywhere we went, Mom and Dad were welcomed as their own parents and grandparents, honoring them and spoiling them with every little comfort. I do not want you to think that Mom and Dad came only to “look back.” They also came to minister, and to see first hand the work that our Lord has called Dave and me to do. 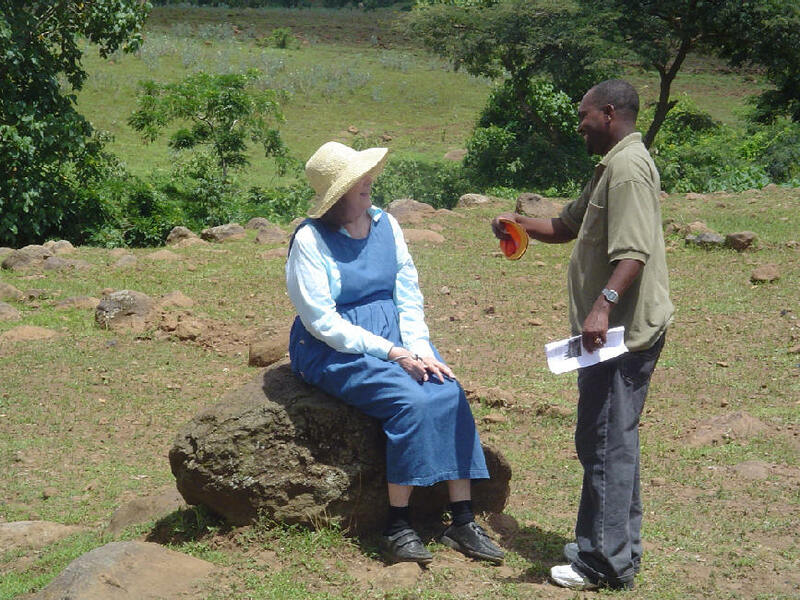 I wish you could have been there watching Adinew attending to Mom as she climbed a mountain; she was determined to see the first church “we” have built in rural Alaba! Many times Mom played her flute; sometimes to small gatherings in homes, sometimes to 2000+ church gatherings. Mom also taught several women’s classes with me; what a joy that was for me!! 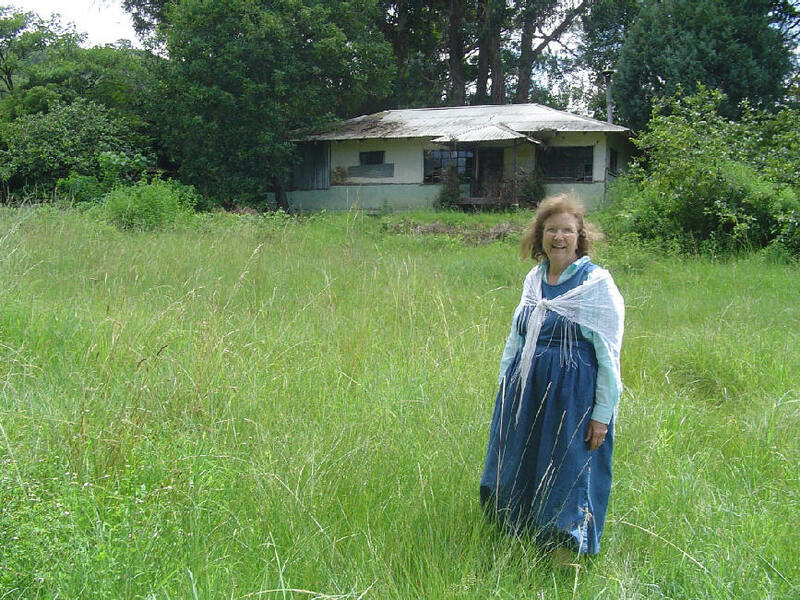 Having the personality of the “perfect grandmother,” she nurtured everyone she met. Daddy spoke on several occasions also, praising our Lord for His goodness and challenging the believers to continue to grow. We had student receptions, where his former students came to greet him. A special blessing of the Lord was the repentance of a student who had wandered away from our Lord for many decades; he came before the congregation just the Sunday before we arrived, confessing all, and asking for forgiveness. What a joy it was to fellowship with him, rejoicing in the never-ending grace of our Lord Jesus! Also, Daddy launched the 2nd Library CD and bought oodles of books in Addis for the 3rd CD. These CDs are the only ones in Ethiopia; he has scanned hundreds of books in English and Amharic onto CD for use by Ethiopian Christians. 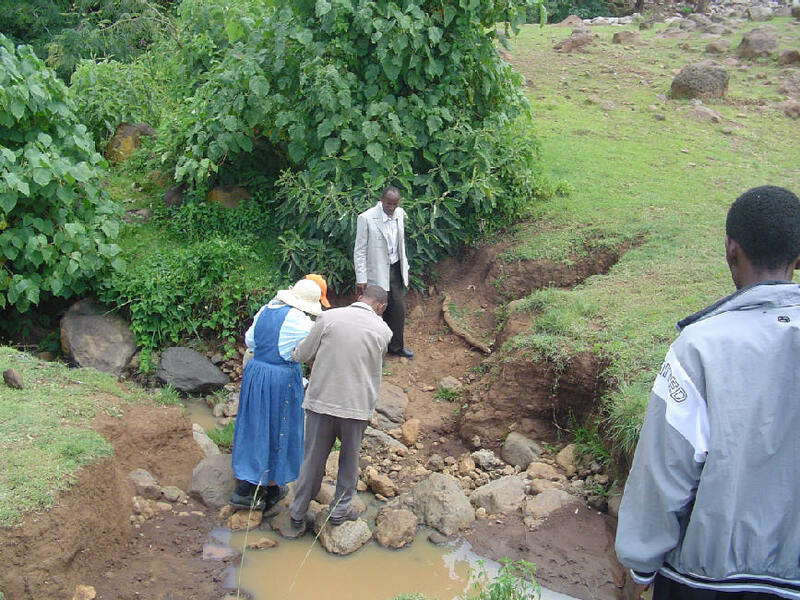 Alaba church leaders helping Mom cross a creek. The Director of Christian Education in Alaba fanning Mom. Daddy couldn’t even wait to leave the airport before getting CD #2 out for Fasil! 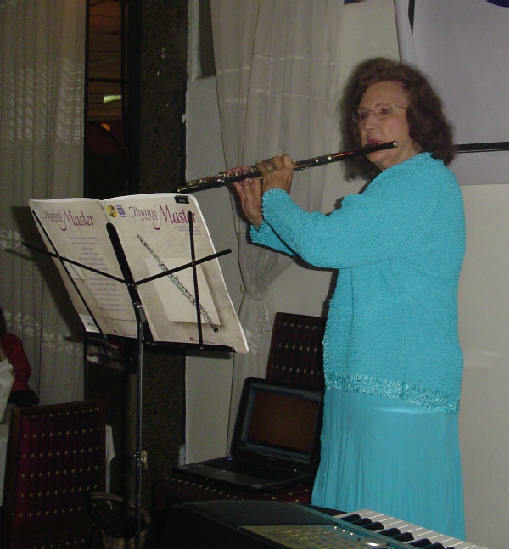 Mom’s flute music was a big part of our ministry. 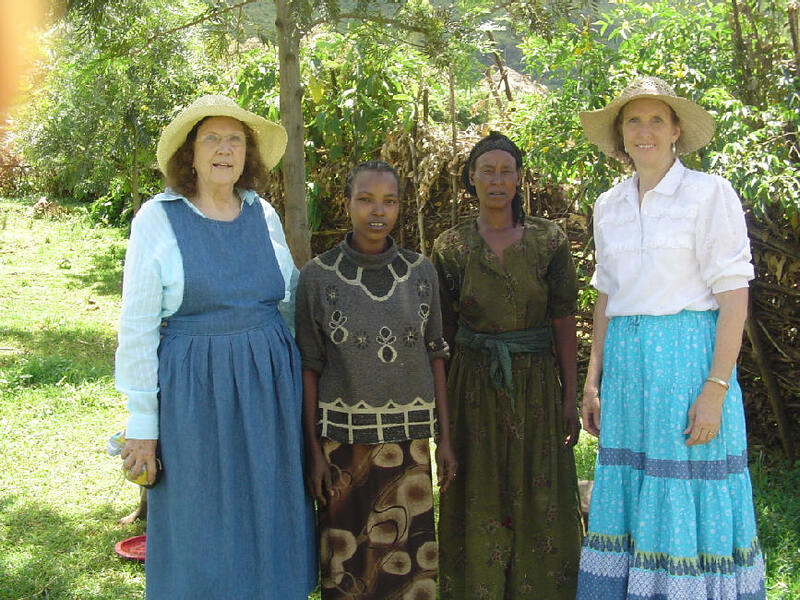 What a delight to work side by side with Mom in encouraging the Christian women of Ethiopia! There is a second lie from the Evil One that tempts the older generation; it is the lie that Retirement is in God’s plan. Our American culture is so retirement-oriented that even in the Lord’s work we think that beyond a certain age there is no work for us to do. Or worse yet, we have this idea that we “deserve” a break from working! But I ask you, when did Moses retire? Or Abraham? Or Jeremiah? Or Paul? My dear friends, there is no retirement mode in the work of the Kingdom. The work He assigns us is always suited to us, taking into account our physical limitations, but it is work nonetheless. My mother is not assigned to climb mountains to visit churches on a regular basis, but she is assigned to teach flute to unchurched school children in public schools, showing them His love, and she is assigned to play her flute in churches for worship times. Daddy is no longer assigned to a rough primitive educational setting, but he is assigned to scan page after page, thousands of them, onto a CD for the new generation of Ethiopian leaders. The key to success in the Kingdom is faithfulness, obedience, diligence. And this is applicable to all ages, all races, every economic stratus, all academic levels, both genders. No one is excused; too much is at stake! FAITHFUL OBEDIENCE IS ALWAYS HIS WAY FOR US! THERE IS NO “RETIREMENT” MODE FOR THE BELIEVER. This first report would not be complete without a public expression of appreciation to both of my parents for the example that they have set for me, an example of faithful, diligent work for the Kingdom. Thank you, Mom & Daddy! There is no greater inheritance than this! 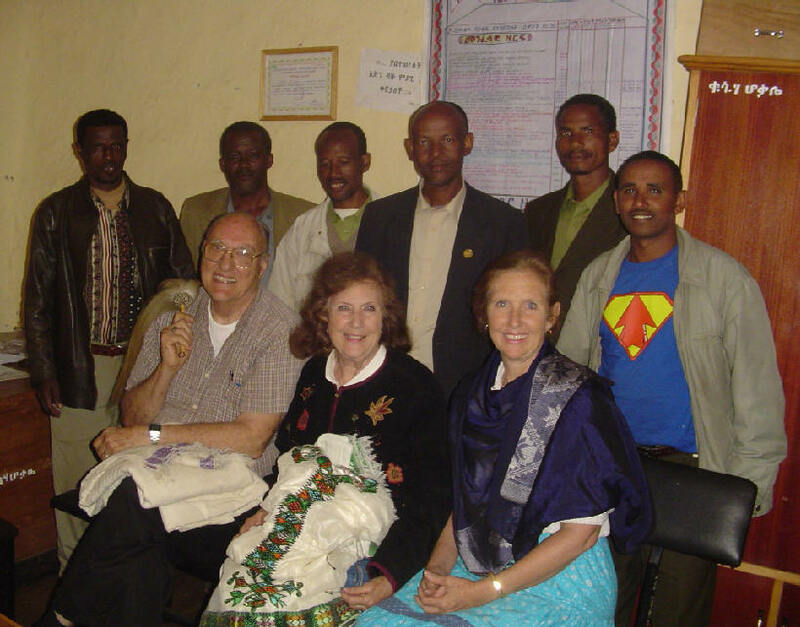 If our Lord wants you to become involved with us in Ethiopia, please make your check payable to BeckyLynn Black. No tax-deductible receipt will be given, but a sincere thank-you note will be sent. 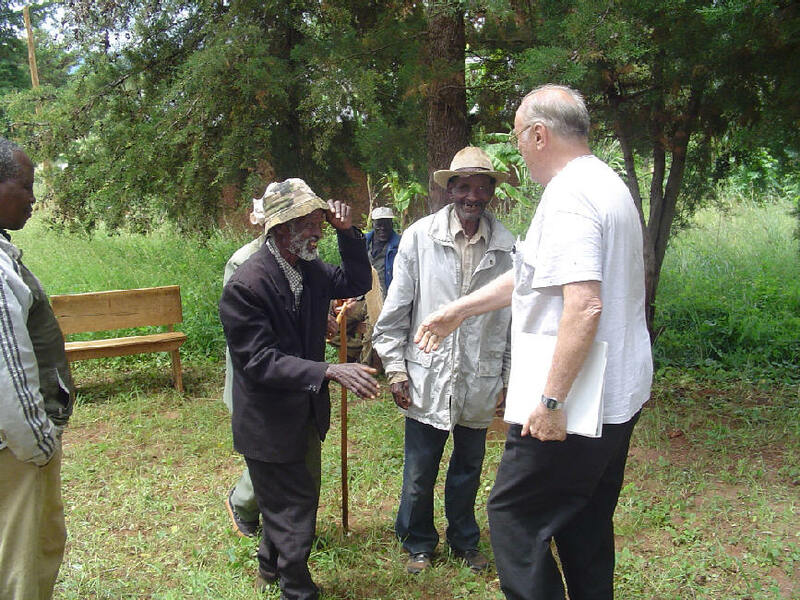 100% of your gift goes directly to the Lord’s church in Ethiopia. We pay our own expenses and we do not deduct for “administrative costs.” May our Lord bless you for your kindnesses to us and our brethren in Ethiopia.